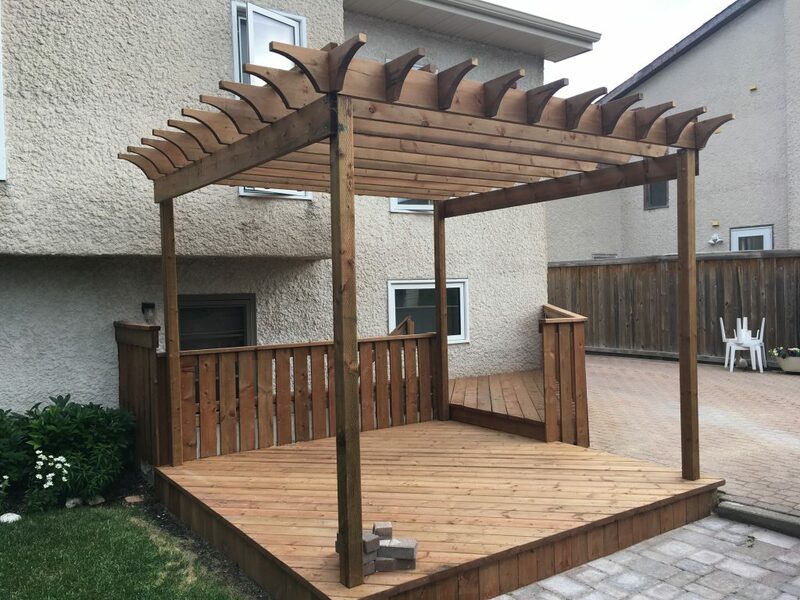 This customer had hired a handyman to build a pergola, replace a rotting fence, and install some paving stones. Unfortunately – the work was started, but not completed, and then the handyman never returned! Our crew came in, inspected the work completed to that point, made some necessary adjustments, and completed the pergola build. We replaced a rotting fence, installed new paving stones, and created a walkway to the garage. The client was so pleased with our work, he had us also build some new flower boxes, and build a new set of stairs to his balcony. After working with the clients on the interior of their home, it was time to pay some attention to the outside. The customers enjoy entertaining and wanted to replace the grassed area of the yard with a patio. To also remove the old deck and build a more functional space, re-purposing a large amount of pavers for the new patio, saving them from the landfill. With a smaller space to work with we were still able to meet all their needs of supplying not only a place to entertain but also a great family space. 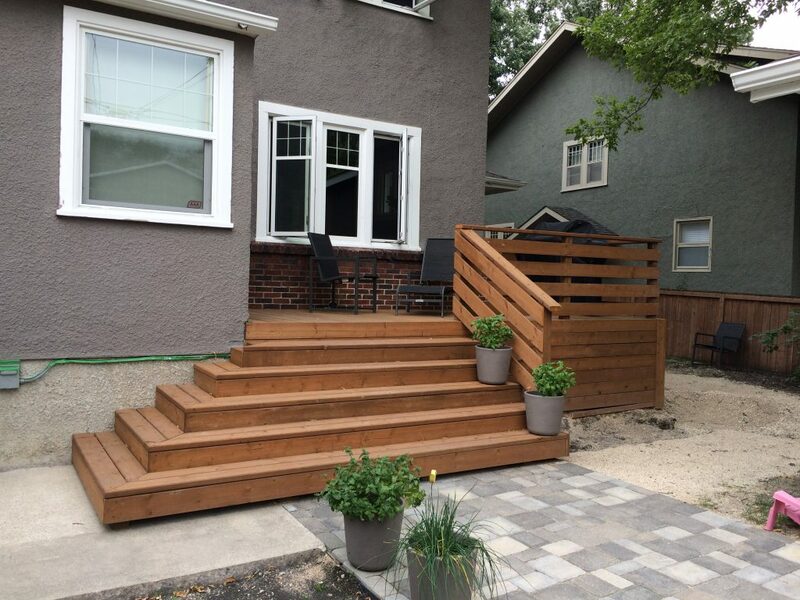 A prior reno had left this homeowner with only temporary stairs that gave her access to the back yard. So, plans came forward for this inviting structure to be built. 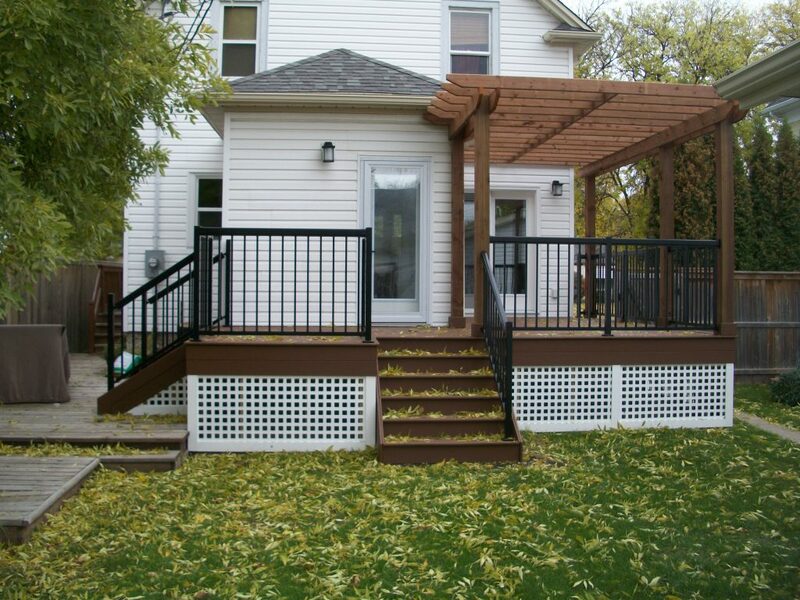 The entire deck / pergola / stair(s) structure is 245 sq ft in total size. All the under framing is green pressure treated, and all the above deck wood is brown pressure treated. The decking material is Trexx composite decking with hidden fasteners. Pre-finished black aluminum was used for the railing system. The underside of the deck is closed off with white PVC lattice trimmed with James Hardie fiber cement.